I went out to Second Home Nature Center this morning for the last pancake breakfast of the season. After snarfing down my cakes and sausage, I headed out for my first walk of the season. During winter the trails are restricted to cross-country skiing, and seeing as how I am not much for the cold, I tend not to get out to the nature center much when the snow is on the the ground. 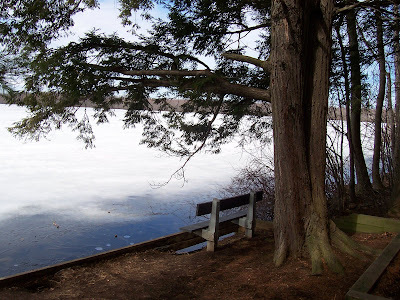 Even though it was a brightly sunny, mild spring day, the ice has not yet gone out, leaving the lake looking very wintery. A small pond was looking more spring-like though. I walked the trail I favor for spring wildflower watching. In a month it will be bursting forth with all the flowers that I do so love to see, but for now I had to settle for sunshine and fresh air. After being cooped up all winter, that was easy enough to manage. OK, count me officially jealous. Was the ice radiating cold air? It's no wonder I am seeing all these migratory ducks in my little Stormwater Park pond. The real deal ain't open for business yet. So glad you were able to go outside and enjoy nature and the early signs of Spring. That was a lovely post.